Nearly every evening between mid-October and Thanksgiving, when the weather conditions are promising for bird migration, Scott Comings sets up a series of nearly invisible nets on Block Island and plays a recording of the call of the northern saw-whet owl, the smallest owl to be found in Rhode Island. His aim is to capture as many of the birds as possible, place bands around their legs, and learn what he can about the migratory habits of the diminutive owl. Comings, the associate director of the Rhode Island office of The Nature Conservancy, is among a growing cadre of biologists and ornithologists from throughout the country who have been banding saw-whet owls regularly since the early 2000s, to get an idea of the bird’s movement patterns and population distribution. The effort, dubbed Project Owlnet, began in Pennsylvania in 1997 and now includes several hundred researchers at more than 350 different sites. Peter Paton, professor of natural resources science at the University of Rhode Island, is another of the Project Owlnet collaborators. He has been banding saw-whet owls since 2000 at locations in Richmond, South Kingstown and Hope Valley. In a typical year, Paton catches more than 100 owls, and some nights when the winds are just right, he may catch a dozen or more in just a few hours. Comings catches similar numbers of owls, though one year he banded more than 200. In the eastern United States, saw-whet owls primarily breed in northern New England and New York and in the Appalachian Mountains, and they winter as far south as North Carolina. According to Rachel Farrell, a member of the Rhode Island Avian Records Committee, saw-whet owls have been documented as breeding in Rhode Island just six times since 1952. Two of those records occurred in the past two years and were documented as part of the Rhode Island Breeding Bird Atlas, which is managed by ornithologist Charles Clarkson. “It seems like the species is maintaining a small but persistent breeding population in the state,” Clarkson said. But many more saw-whet owls migrate through Rhode Island. Those that are captured by Comings and Paton are revealing interesting details about their migration patterns. Paton also noted that the number of saw-whet owls migrating through the Northeast rises and falls every other year based largely on the number of acorns and other seeds produced by area trees. When trees produce large numbers of acorns, they provide abundant food for small mammals such as mice and voles, whose populations then skyrocket. 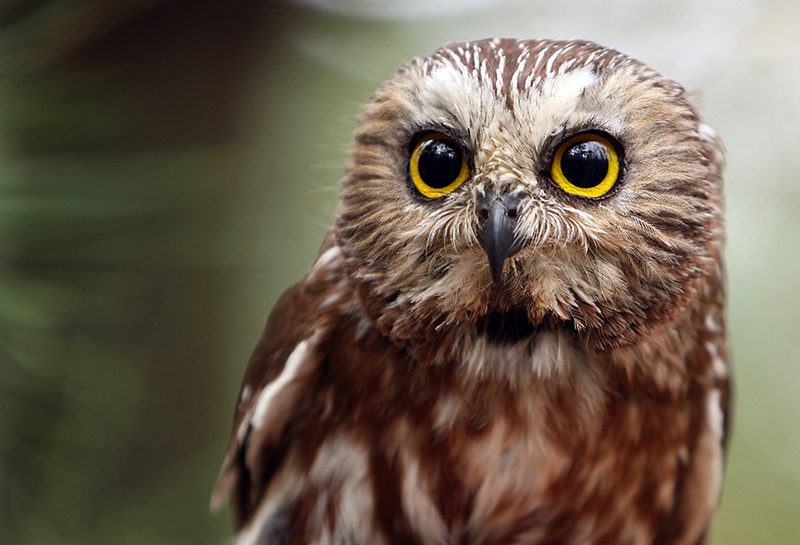 When the small mammal numbers increase, saw-whet owl numbers grow, because the owls eat the mammals and can produce more chicks. Most of the owls caught in Rhode Island fly to Mid-Atlantic states. One of the more unusual findings from Project Owlnet is that birds migrating for the first time often take a different route than older birds who have previous migration experience. First-time migrants tend to be caught along the coast, while adult birds are more likely to follow an inland migratory route. So far, this year has been a quiet one for saw-whet owl migration. Through the first week of November, Paton had captured only one owl, and Comings hadn’t fared much better.